The jig's up! The pig squealed! Over 39 Pink Pigs crammed into a little box! Now it's up to you to let them out! No mud slinging allowed in this fast-paced family game where players compete to corral the most pigs. Get rid of your cards first and be awarded the prime pile of pigs. Sounds easy, but pigs can be slippery! The more cards you have, the better your chances of calling out HogWash! and clearing away the deck! But don't hog the cards too long or you'll get stuck. The player with the largest stockpile of swine after the final round wins. Quick thinking and clever card play determine how high you'll heap your hogs. 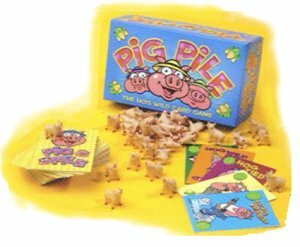 Pig Pile is a fairly simple game that is easy to learn and play. What makes it shine, however, is the fact that you are competing to earn the most pigs (miniatures included). The components are great and the cuteness factor alone makes this an instant hit for children.